When most Americans hear the words "roller derby" today, they think of the kitschy sport once popular on weekend television during the seventies and eighties. Originally an endurance competition where skaters traveled the equivalent of a trip between Los Angeles and New York, derby gradually evolved into a violent contact sport often involving fake fighting. But after nearly dying out in the nineties, derby has been making a comeback. From a mere handful of leagues in the UnitedStates just a few years ago, there are now more than 17,000 skaters in more than 400 leagues around the world, with hundreds of thousands of die-hard fans. 'Down and Derby' will tell you everything you ever wanted to know about the sport. 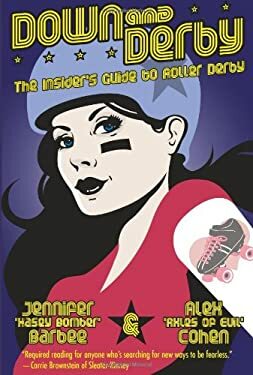 Written by veteran skaters as both a history and a how-to, 'Down and Derby' is a brassy celebration of every aspect of the sport, from its origins in the late 1800s, to the rules of a modern bout, to the science of picking an alias, to the many ways you can get involved off skates.Informative, entertaining, and executed with the same tough, sassy, DIY attitude -- leavened with plenty of humor -- that the sport is known for, 'Down and Derby' is the first and last book on derby you'll ever need.